A major nuclear incident was narrowly averted at the heart of Britain’s Royal Navy submarine fleet, The Independent on Sunday can reveal. The failure of both the primary and secondary power sources of coolant for nuclear reactors at the Devonport dockyard in Plymouth on 29 July last year followed warnings in previous years of just such a situation. If you think nuclear facilities in the United States and other Western nations are any safer than Fukushima or Devonport, you’d be mistaken. Because these facilities often operate under the cloak of secrecy, it is impossible for us to know how many times such incidents have occurred in the United States. What we do know is that on March 28, 1979 the 3-Mile Island nuclear facility in Pennsylvania experienced the worst nuclear power plant accident in American history when a meltdown occurred in one of the facility’s two reactors. Thus, accidents at these facilities are not unprecedented. 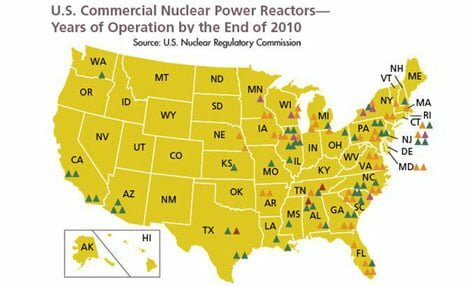 There are currently 65 commercially operating nuclear power plants with 104 nuclear reactors in 31 states around the country. What Chernobyl, Fukushima, 3-Mile Island and Devonport show is that we are not immune from the real possibility of a massive nuclear disaster. Given the sheer concentration of these facilities around major population centers, especially in the eastern United States, one can’t ignore the potential for an emergency on U.S. soil that irradiates a huge portion of our population and forces region-wide evacuations. Consider a situation where the United States comes under attack by a Super-EMP(electro magnetic pulse) weapon or a powerful solar flare that takes down the power grid. In such a scenario, a collapse of our banks, stock markets, economy, and systems of commerce would be the least of our worries. We already know that the processes and procedures in place to test and maintain back-up power generators is lacking, as evidenced by the failure of similar generators at medical facilities following Hurricane Sandy in 2012. Couple those system failures with an EMP or solar flare that renders the system completely inoperable, and people living within a 100-mile radius of a nuclear reactor would have about 90 minutes to evacuate before radiation spews all over them. While a nuclear disaster of this magnitude is an outlier, it is not out of the question. We’ve experienced one in the last few years, and it’s still not under control and continues to contaminate ocean water, as well as the residents of Japan (and perhaps even the United States). The threat of a nuclear meltdown if you live within several hundred miles of a nuclear facility is one worthy of consideration, planning and preparation. You’ll need to have a bug out plan in place and be ready to put it into action in seconds – not minutes. You’ll have to move fast – very fast – at the first sign that a nuclear event is imminent. Tens of thousands of scared and panicked people will be trying to figure out what to do, how to get out of town, and where they will go. If you have a plan in place ahead of time you’ll at least be able to move a few minutes sooner than the rest of the golden horde. And when we’re talking 90 minutes until meltdown, even 5 minutes could be a life saver. Nuclear disasters can happen. We’ve seen it with our own eyes. It will happen again. That is just about guaranteed. Be prepared to act when it does. On September 12th 2012 the Dutch people have convinced themselves they actually had something to choose from on election day. The current ruling party in the Netherlands was declared winner, it’s leader (a self-proclaimed “liberal” named Mark Rutte who attended the 2012 Bilderberg conference) recently shoveled some 4 billion euro into the pockets of European bankers, with an option of some 140 billion euro more, when the European Commission deems more cash-injections necessary. Meanwhile the little people were allowed their glorious day of self-deception in the voting booth. Some of the political parties on the ballot pretended opposition to EU supreme rule, others openly embraced it. I have watched leaders of all major parties in the Netherlands openly proclaim that losing national sovereignty- in some cases abolishing altogether- is really a good thing- and all scepticism to the rule of European technocratic commissioners must either be met with accusations of xenophobia, or horrific specters of doom must be sketched if there is no immediate compliance to EU dictates. As a Dutch citizen, it’s truly disheartening to witness these hordes of people voting themselves into oblivion, and doing so with a self-complementary smile- probably thinking they are actually voting for this or that party- while they are in fact tightening the chains that hold them bound to unelected commisszars. Therefore, the election results were not somewhat, but completely insignificant- a shameless dog and pony show designed by a transnational elite to keep the masses in a steady propaganda-slumber, while they happily vote themselves further into a technocratic construct that would put emperor Nero to shame. Whatever incidental party declares “victory” over the other shades of gray, it’s clear that the true winner sits behind a desk, laughing in his fist, knowing that slowly but surely, over the course of not years but decades, the peoples of sovereign nations are wrapping what’s left of their constitutions in a blue flag sprinkled with white stars. And in due time, this flag will be wrapped into an even bigger flag depicting the globe, signifying global government. In any case, here’s a picture of the real winner of elections held all throughout Europe, and he’s not even on the ballots! The prophecy by Paul Volcker the speaker is referring to, went something along the following lines: “if we are to have a truly global economy, a single world currency makes sense.” But, as it turns out, 50 years ago the process she talks about was far from impossible to imagine. In fact, as the Bilderberg memos of 1955 reveal, plans for a world government were well beyond the stage of geopolitical daydreaming fifty years ago. Meaning of course, global government must replace the sovereignty of the nation state of old. In this context the word “peaceful” translates to the absence of war- for once potentials rivals are eliminated, there is no longer conflict. A consolidation of power, in other words, by the central banks of the world. In a prepared speech, condensed in spoken form at the Council on Foreign Relations headquarters in New York on April 26th 2010, Trichet discerns three ingredients of which “the significant transformation of global governance that we are engineering today” consists. “In the area of central bank cooperation”, Trichet stated, “the main forum is the Global Economy Meeting (GEM), which gathers at the BIS (Bank of International Settlements) headquarter in Basel”. In 1970, long-time member and chairman of the Bilderberg group viscount Étienne Davignon published a report in which the ministers of Foreign Affairs of six European nations pledged to further the European agenda through mostly informal gatherings. The report, to which the ministers of Foreign Affairs of all major European nations pledged allegiance, admits that the further integration of nations must follow a gradual, incremental path in “successive stages”. Informal, in this respect, means outside the reach of journalists- in the same way the annual Bilderberg meetings are described as informal gatherings where transnationalists can share thoughts without some irritating news person running around recording their exchanges. Yes, the most significant of “informal” meetings, we have come to learn, has been chaired by none other than Mr. Davignon himself in the last decade. Well, not so according to the Davignon commission which he chaired back in the early 1970s, and the subsequent Davignon report which he co-wrote. In the report, Davignon and his co-conspirators outline that all these informal meetings are anything but “incoherent”. We now know of course that the process toward a single European currency, as well as single European “voice” has been in the making much longer than that. On September 7, 1992, two term President of the European Commission Jacques Delors gave a speech to the Royal Institute of International Affairs titled The European Community and the New World Order. Invoking the famous New World Order-speech of George H.W. Bush in 1991, Delors took its meaning one step further, speaking of “world government”, “transferring sovereignty” and a “worldwide single market”. One of Delors’ main “accomplishments” was writing the so-called Delors Report: a document in which he outlined how a European economic and monetary union could be established as quickly and effectively as possible. Submitted in 1989, the Delors Report envisions three stages along which the road to world government will be reached. It comes as no surprise that the most important factor within this process is the complete and total “independence” of the European central bank. The first stage would be accomplished with the completion of a single European market. The second stage would consist primarily of the merging of the different central banks into one giant European central bank like an octopus, spreading its tentacles across the continent. The third and final stage he proposes would see the establishment of a single European currency. The main thread of the report is: total monetary independence should be transferred from the elected politicians to the unelected network of central banks throughout the European continent, consolidating power with the help of a single currency. Of course, today we know that his report was anything but an idle document written by a transnational daydreamer. It was actually the policy blueprint for the elite, outlined in the immediate aftermath of the Second World War. As current events unfolding in the “eurozone” point out, the Report describes the coming implementation of the proposed “stages” with staggering accuracy. “Today many economists speak of the transition to a new stage- a quantum leap to a worldwide single market. There is plenty of evidence of this; the international credit card in the consumer’s wallet is particularly symbolic.”, Delors notes in his speech for the Royal Institute of International Affairs. Here it is. The President of the European Commission readily admits that world government is the plan. He also admits that economic integration, as happened less than a decade later, is not sufficient when this goal is to be achieved. Again: this is exactly what Ettienne Dávignon was aying when he spoke of the succesive stages by means of which further European integration will be secured. Indeed, the merger of the three nations into one North-American community ranked and ranks very high on Bilderberg’s list of objectives. Following the ruling by the German constitutional court, current chairman of the unelected European Commission Barroso held a textbook tyrannical speech before the going-through-the-motions European Parliament- a body which has refined the art of upholding the fig leaf of democratic legitimacy while in fact only an advising capability exists- if even that. In his speech, mister Barroso stressed that the time for a European Federation has now come. Quite literally preaching to the quire, the chair must have known this proposed Federation of European nation-states was a dream long cherished by the founder of the body he spoke to. That same ideological frontrunner of the EP, H.R. Nord (nicknamed “mister Europe”) in a 1945 article which I have translated out of Dutch, made clear that European integration was but a steppingstone towards global government, indicating that all integration of the world’s regions are regional means to a global end. In his first article, “For a Federal Europe”, Nord states right out of the gates that: ‘The problem of a New World Order is now more acute than ever. Now the war is ended, and simultaneously the prime stimulant of cooperation between the superpowers, it is of the greatest importance people realise what is required of us if we are to regain peace: an effort no smaller than the one which led to the defeat of the enemy.’ According to Nord though, the recently created United Nations was not strong enough to lead this effort. Referring to the Charter of the United Nations, agreed upon by the first member-states in the months after the war, he criticizes its main principle of “sovereign equality of states” with the argument that sovereignty is what got them into this mess in the first place. All these statements and writings from the past a clear picture emerges. Despite elections held in individual member-states, the plans for further economic, political, and military integration, prescripted for many-a-decade, are being implemented stage by stage, decade by decade, perfectly insensitive to incidental election processes designed to satisfy the masses into believing their voice counts. Jurriaan Maessen’s website is Explosivereports.com.